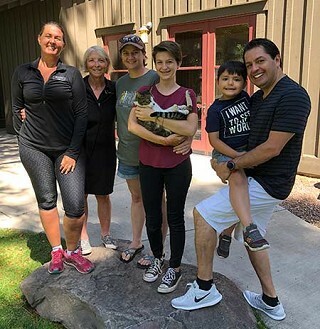 A wayward cat that somehow made his way from Bend to Sisters was reunited with his owner after being cared for by the staff at Rio Restaurant and Sisters Athletic Club. "For nearly a week a sweet kitty was hanging around the grassy area behind the Sisters Athletic Club and Rio Restaurant," Cindy Tintle of SAC reported. "Four-year-old Nicholas, the son of Rio's owner (Roberto Cardenas) developed a natural bond with the affectionate kitty. Nicholas made sure the kitty was fed and taken care of whenever he visited the restaurant. One evening the cat even went home with Nicolas and his dad because Nicholas was worried that the cat was lost and unable to find his home." Rebecca Womack from Sisters Athletic Club took the cat to Sisters Veterinary Clinic, where they discovered a microchip with the owners' contact information. However, the phone number associated with the account was disconnected. Tintle continued to do some digging online and found an email address for the kitty's owner. The owner lived in Bend and somehow "MauMau" found his way all the way to Sisters. Tintle noted that "MauMau was reunited with his family after his little Sisters vacation, and it seems as if he enjoyed the hospitality shown to him while visiting our sweet little town."